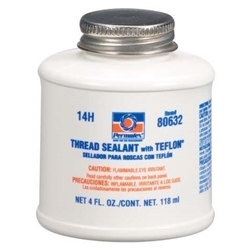 Permatex Thread Sealant with PTFE is a smooth white paste with a slight alcohol odor. It is a fast acting paste/lubricant designed to seal pipes, fittings and threaded connections against leakage and loosening. Seals pressure to working rating of pipe in air, oil, gas and hydraulic systems. Lubricates threads for quick, easy assembly and disassembly. Prevents galling and corrosion. Will not tear or shred like tapes. Remains pliable through a wide temperature range and outperforms other pipe dopes.